Marina Beach Restaurant gives you the chance to enjoy our buffet with numerous culinary masterpieces presented in an unusual manner in combination with exclusively delicious desserts in a luxurious and cosy atmosphere. 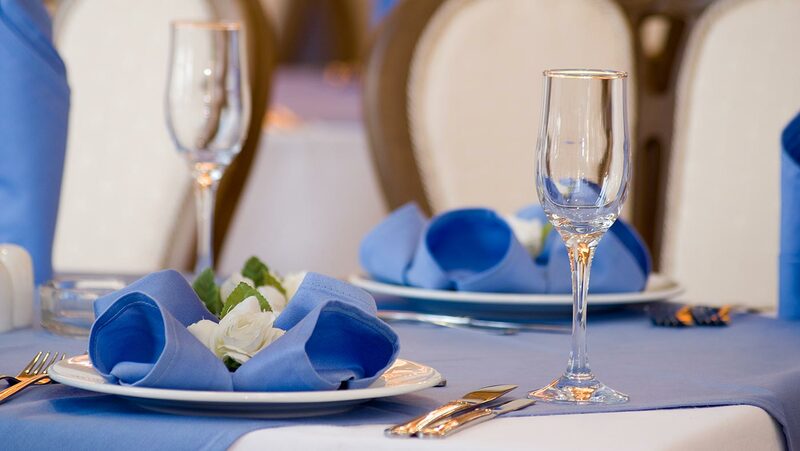 Exceptional service and unforgettable taste are the distinctive features of this restaurant! 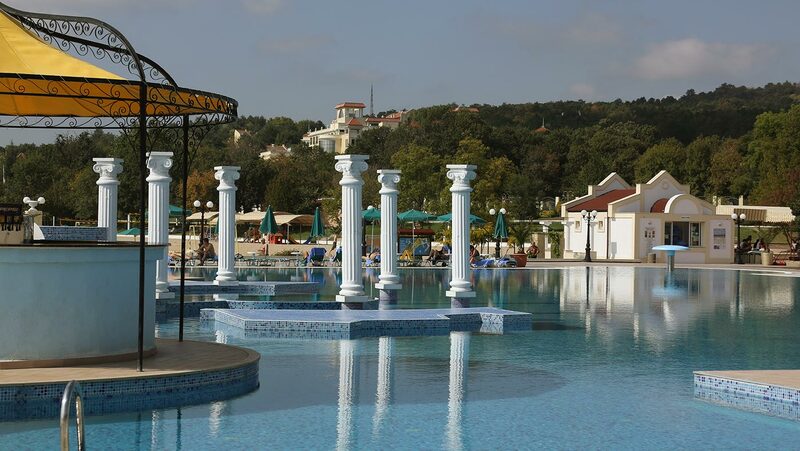 Relax in the elegance of warm colors and nice music in the spacious hall with 260 seats or just enjoy the marvelous view to the sea from the sunny summer terrace with 500 seats, which gives its guests the amazing sensation of ease and tranquility. 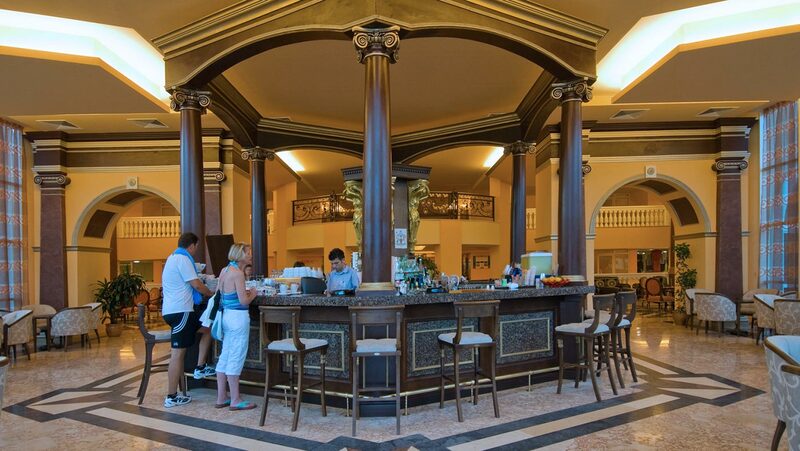 For you convenience, you can use also the bar to the restaurant and the Terrace Bar. 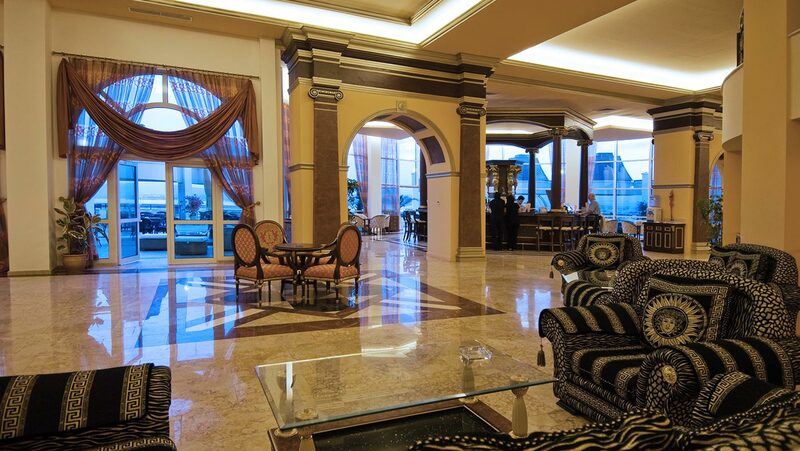 modern and fancy, with exquisite international cuisine! Feel the mystery and romanticism of this unique restaurant! 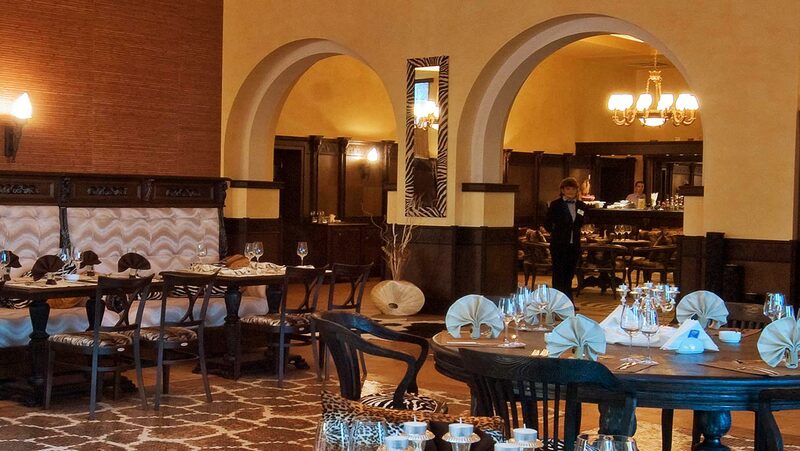 Do not miss to visit this restaurant and enjoy its specialties in a luxurious atmosphere! Enjoy the discreet and professional service, soft music and harmony. The menu in this restaurant is created with special attitude towards food. It is a pleasant culinary trip with delicious dishes prepared from high-quality seasonal products served in a cosy atmosphere with magnificent interior and stylish furniture. In addition, you may try the carefully selected beverages in our rich Wine Lists, which are made for the real lovers. You may use any of the 150 seats in the hall. 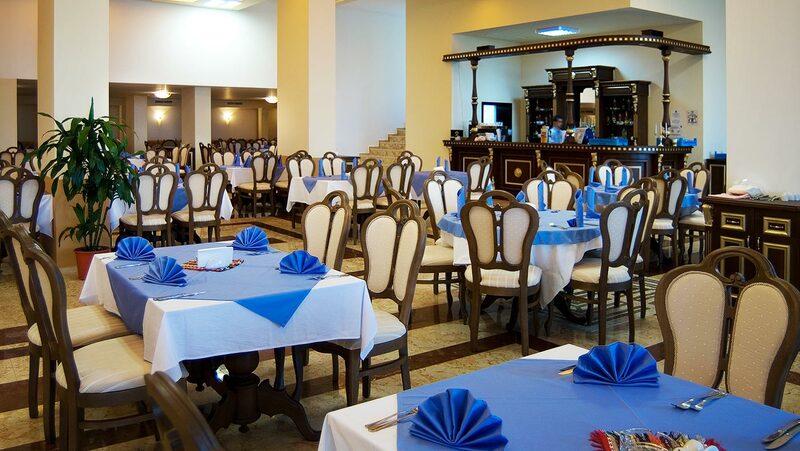 You may visit the restaurant upon confirmation of your reservation after payinh at the reception desk. is located in the hotel lobby and is suitable to start the day with your morning coffee or end it with your favorite drink. Nice drinks create memories, so we invite you to share them with us. 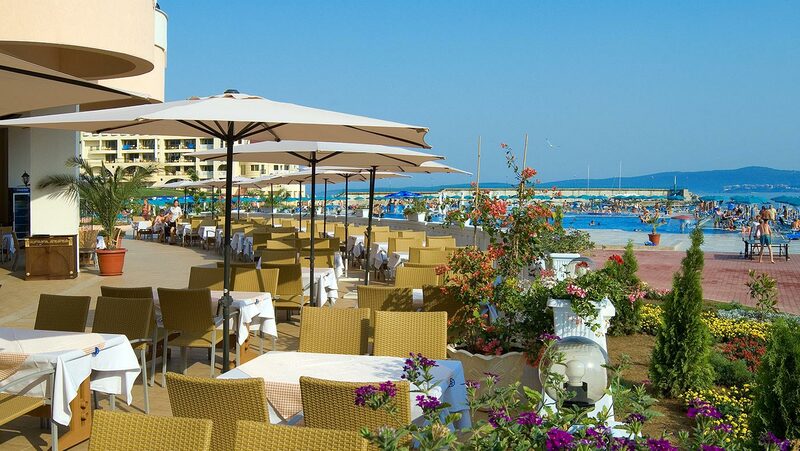 After the long day at the beach, continue your summer tour in the world of cocktails at this memorable place. The rich menu at the bar, which includes soft drinks and alcohol and numerous versions of classic cocktails, attracts the choice even of the most demanding guest. The lobby bar will take you into a world of magic of luxurious atmosphere and nice emotions combined with a carefully selected playlist of music. The interior is designed with taste and style aiming to impress its guests with the feeling of comfort, space and aesthetics. The guest may use the 120 seats of the cool hall and the 180 seats on the terrace opening an astonishing view to the golden beach in the bay. 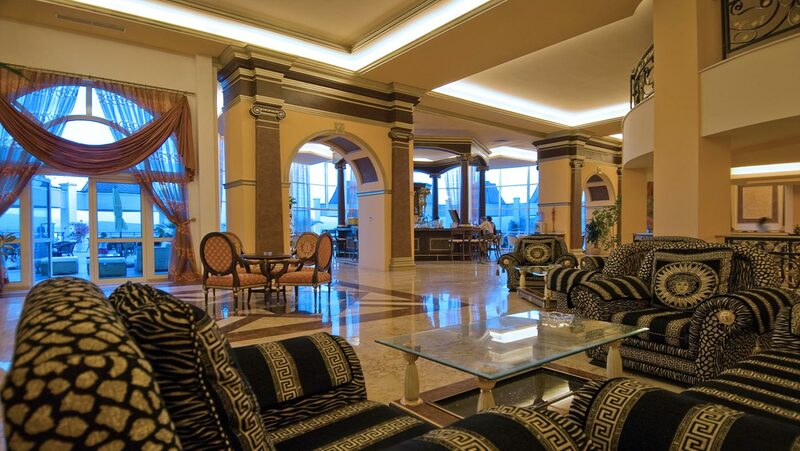 ease and peaceful atmosphere, perfect for you morning coffee, review Bulgarian and international newspapers and magazines within immediate proximity to the rich buffet in the hall of the main restaurant or just have a refreshment drink on your route to the swimming pool. This is the Terrace Bar at Marina Beach Hotel. It makes your day much more pleasant with numerous cocktails, alcoholic, soft and hot beverages prepared to tease your sense. A wonderful place to relax from the scorching sun in the late afternoon hours from 04.00 PM to 05.00 PM with a cup of coffee or tea and a wide variety of sweets and snacks. This combination of refreshments and friendly company in the center of the swimming pool gives the feeling of full relaxation and bliss. Just a step away from the Aqua Bar, we will offer you various sandwiches prepared right in front of you every day from 11.30 AM to 06.00 PM.